Another year almost over... and a new one to begin. Could it really be true that the older you get, the quicker time goes by? Still not sure about that one... although it is hard to come to grips with the fact that we are at the point of wishing others a " Happy New Year". Since it is and we are... we might as well have some fun in the process right?! The fun is not only in the celebrating, but first and foremost in the preparation prior to the celebration. 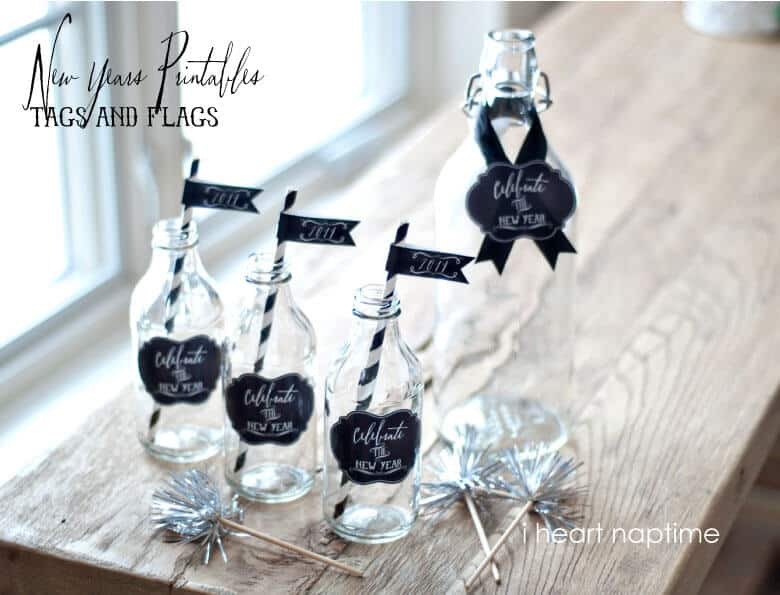 We put our thinking caps on and came up with these ideas for DIY New Years Celebrating. 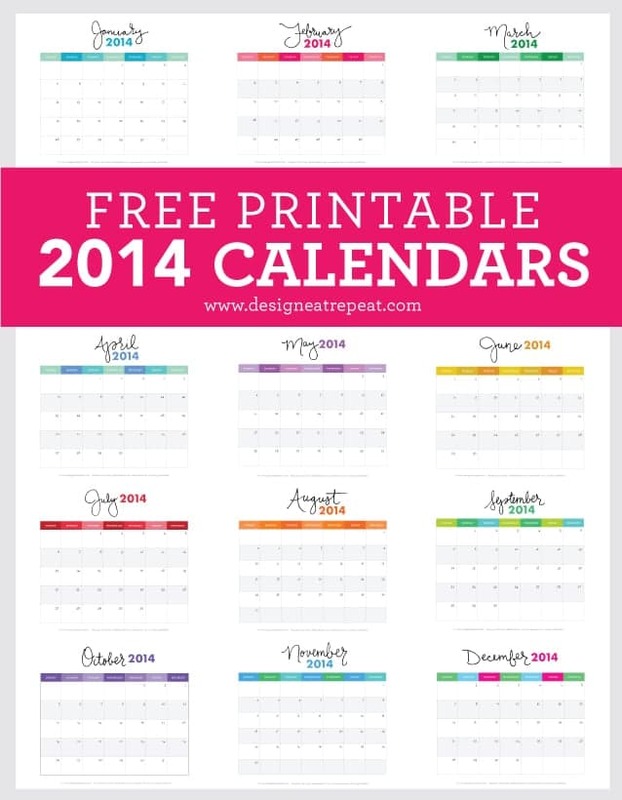 Sharing the love of free printable calenders to get you started on the right track in the New Year! Don't forget to print your calender off soon! Sharing a little love with you today just in time to for your New Years celebrations! Anders Ruff for I Heart Naptime. Turn a plain old bottle from drab to fab in minutes with these simple, easy and free printables! Looking forward to ringing in the New Year?! If you are looking for some New Years celebrating inspiration... check out some that we found!!! What a glorious, joyous time! Just sharing a little look at our Christmas Tree and some of the ornaments we made. 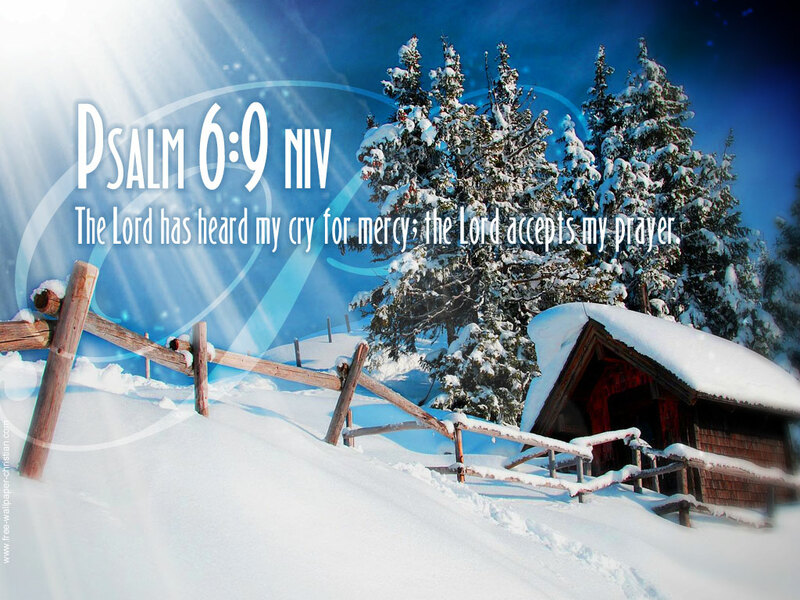 As you gather with your families and friends may you be truly reminded of the true meaning of Christmas and carry it in your hearts always. Make your Christmas a little merrier with a batch of all natural Cinnamon Orange Gummy Men! Do gingerbread men only have to be made out of gingerbread and decorated with icing and raisins?! This time is a "no". But still a very good "no". Think of a blend of orange and cinnamon in the shape of a mini gingerbread man... this is what these are! Peppermint and chocolate coming your way in the form of cookies. Double Chocolate Peppermint Cookies that is. Which also happen to be gluten and dairy free and very tasty too! STOP!!! Don't serve your Christmas beverage in just any old ordinary cup, get creative and make a Festive Ornament Drink Bauble instead! Can't take credit for this creative idea... all the credit goes to Dawn, of Not Just a Mommy blog. we had to get busy and make a set of our own for our Christmas festivities! Making homemade vanilla extract has been on our "hurry up and get to it list" for awhile now. Glad we finally hurried up and got to it. Back in early September we made our batch of vanilla extract knowing that it had to steep for at least 3 months and that these precious little bottles of heaven would make perfect Christmas gifts. Back with another Peppermint recipe to share! We are just in that kind of mood!!! 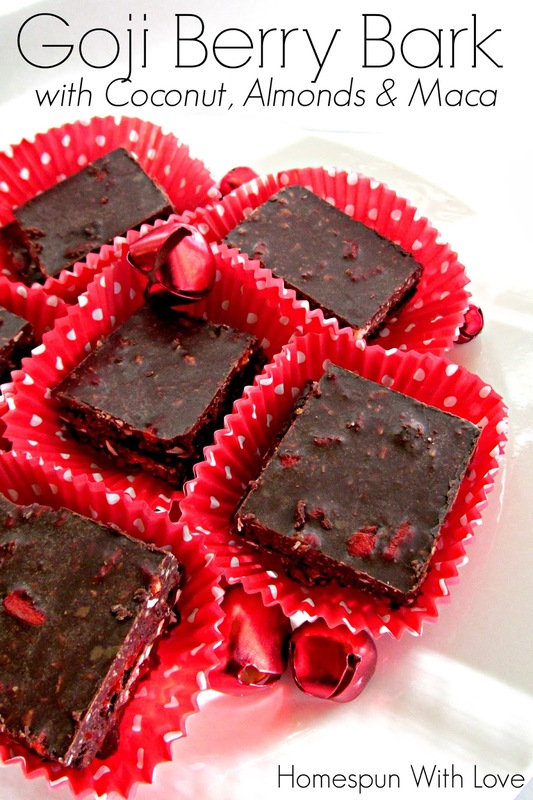 So there are peanut butter cups, almond butter cups and now... Peppermint Coconut Dream Cups! One can NEVER have too much peppermint at Christmas time. 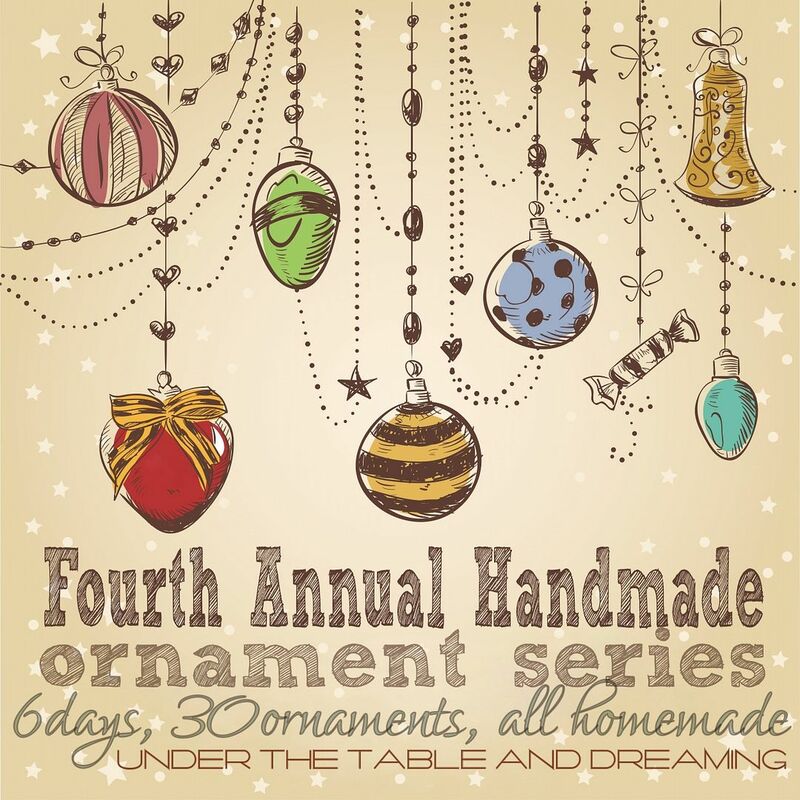 Under the Table and Dreaming's Fourth Annual Handmade Ornament Series! We love Stephanie Lynn and all of her creative talent! We have been inspired many times by her wonderful creations. Our handmade ornament contribution was a simple one to make. So simple that you can make up many in no time! We would like to introduce you to our Paper Straw Vintage Ornaments. Candy Cane Cereal Treats! These treats are not only on the healthier side, they can be made up pretty much last minuet to use as party favors or gifts and just munching with the family. We took a tiny break away from our beloved red and white, peppermint candy cane crafting theme to interject a little silver and gold sparkle! At Christmas time there are many traditional scents, flavors and favorites. One of them being spice, in the form of Mulling Spice Bouquets and since it is the giving season we wanted to gift them to a few favorite people. Have you already figured out we have an obsession with peppermint?! Look, smell, taste the entire peppermint thing we just stinking LOVE! Okay, now that we have calmed down a bit we can share our Peppermint Lip Balm & Christmas Packaging idea with all of you. Instead of reaching for those artificial Christmas and Holiday home and room sprays full of all those yucky chemicals, think about making a healthy investment in some homemade organic essential oils to use to make your own spray AND... know those essential oils go along way for many other uses too. We made up a Natural Christmas Room Spray using scents we like this time of year, but any scents you like can be used as well. If you do not have a real tree this year, even if you do, a natural room spray will be a welcome addition to your environment. Oh no, somebody is on the naughty list! Having some fun today with our Naughty Vintage Jars. These cute naughty vintage printables are from the very talented Free Pretty Things blog. You will find these and so many more adorable vintage printables on the blog. Making homemade Christmas ornaments as gifts or for your own Christmas tree has to be counted as one of the many traditions of Christmas. Each one is a labor of love from the maker and a keepsake for many a Christmas to come. Today we are adding to our collection these Stickers & Stripes Ornaments. If pumpkin is the food for early Fall, Halloween and Thanksgiving, gingerbread and peppermint must be made for Christmas! At least they are in our Christmas world. We came up with a healthy Gingerbread Smoothie that made our taste buds very happy! We were so inspired by this beautiful Winter wonderland Christmas wreath made by Jen of Craft-O-Maniac, that we just had to make one too! Thankfully, we had all the craft materials on hand. We call this our Christmas Church Wreath. Do you have a window that could use a little Christmas cheer?! Our kitchen nook widows received a Christmas Window Garland and now they are cheerful and festive! Under the Table and Dreaming Annual Handmade Ornament Series ~ and we were invited!!! Under the Table and Dreaming Annual Handmade Ornament Series! We liken Christmas ornaments to women' s shoes... one can never have too many right?! We would love it if you stopped by to see our ornaments and see what other bloggers have created too! When boys are really young a snow globe is a snow globe is a snow globe... but when they are older...10,11, 12 say... they need a snow globe more suited to their likes. Maybe something like our Comic Book Snow Globes! Hello friends! This morning we have the honors of guest blogging over at Design Dazzle and participating the 2013 Christmas Wonderful Series!!! We love this series with all of the talented bloggers offering such a creative variety of crafting inspiration! We are sure you will too and we hope you will hop on over today and check out what we are sharing and stay awhile and see what everyone else is up too!!! We are in full Christmas decorating mode here!How about you?! 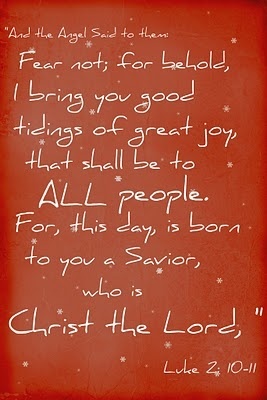 Today we are excited to share with you our Christmas Chalkboard Sign. So what is black and white and a little red? Come take a looky! Candy canes and gingerbread and visions of sugar plums dancing through our heads. We have a deep love for candy canes and gingerbread ANYTHING! We were feeling the need to pull out our old friends and decorate a Candy Cane Gingerbread Mantel. How is your Christmas decorating coming along?! Just in case you need some beautiful Scandinavian Christmas decorating ideas or just want some pretty Christmas things to look at... check these out! We LOVE each and everyone!